Discussion in 'MacBook Pro' started by Mobius 1, Jun 20, 2011. It depends on how much ram you have installed. With 4 gig of ram it will show 384? I believe, and 512 if you upgraded to 8 gigs of ram. really, i first thought it's the processor? Yes it does. The system sets a side a percentage of whatever amount of ram you have installed. If you add system ram it will set more a side as video memory. When I bought the 13 inch MBP, it only had 4 gigs of ram, and used 384 mb's for video. Once I upgraded to 8 gigs of ram, the system reserved 512 mb's of that for video. I don't know if it will go higher if you install more than 8 gigs though. Does that mean 8GB of RAM would increase gaming performance? i thought you use the 6750M for gaming? yep, i hv 512 vram for the onboard and 256 for the 6490. on 8gb ram. I have a 2006 MacBook. It has 2GB of RAM, but the vRAM is only 64MB. Gaming performance might improve, or it might just improve the quality of textures loaded during your games. Someone with more knowledge might be able to answer this better than I ever could. I don't know anything about the 2006 Macbooks. I just know that the video memory increased on the 2011 MBP once I installed more ram. 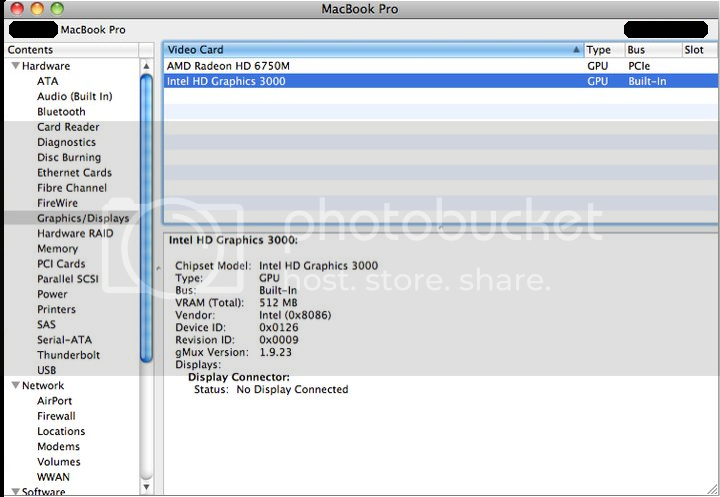 wait does that mean on every 2011 MBP 15" [and possibly 13"] you put in 8GB you get more vRAM for HD3000?? To be pedantic, the HD3000 has no "VRAM." It utilizes some system RAM instead of having dedicated RAM built in to it, or next to it. The effect, however, is the same--upgrading to 8 GB RAM increases the amount of RAM available for the HD3000 to use. When I ordered my Macbook the 348MB didn't change into 512MB when I selected 8GB instead of 4 (double checked). makes me wonder, how much vram does it use when 16GB ram is available? Actually, i have got a 500GB HDD @ 7200Rpm And a OCZ Vertex 2 SSD. But normally it should automatically switch between them, when i start a game it starts using the Radeon gpu. :[ damn. i would love to have a 512mb 320m. It's just a feature that the sandy bridge integrated graphics have. The iMacs use separate AMD graphics with their own graphics memory, so changing the system RAM has no effect on the graphics memory. The amount of shared video memory is normally dynamically allocated to your integrated graphics processor. It is the maximum that the graphics processor can use out all your available memory, but it doesn't mean it will. For example if I'm running just a few brower windows, it won't need much.